There is always that one sibling that insists on doing things differently. 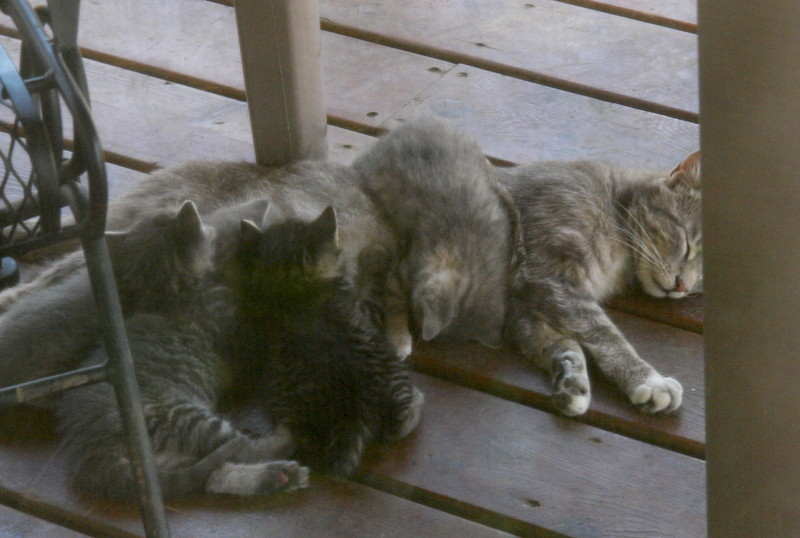 This is our litter of kittens from summer-2014. The backwards kitten (“Kit”) is a unique personality. Since this picture was taken, she survived a 10-day solo excursion into the wilds of our farm (when cats disappear that long around here, it is extremely rare for them to return), mysteriously lost a few inches of her tail, and is currently lobbying for a promotion to house cat. Momma cat, “Cleo-cat-ra”, is a stellar farm cat, keeping the vermin population at a reasonable level. She seems to have inherited good genes from her grandmother “Sweety“). The kids are anxiously awaiting the arrival of the next litter of kittens from Cleocatra. We saw an orange tom cat around the farm two months ago, so we might have a new color to add to our furball collection. So, who is the one in your family that insists on doing things their own way?